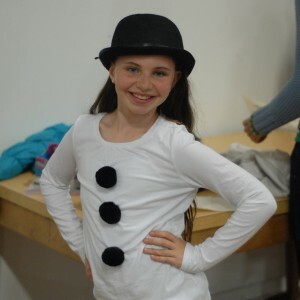 After completing her recent run as Alfia Scragg in Li’l Abner with the SFArtsEd Players, Sara went on to wow the crowd at her school talent show by singing and dancing to the song In Summer from the Disney blockbuster animated musical Frozen. Sara has been performing in the talent show since before she even started at the school, grabbing a spot in her brother’s first performance as a tap dancer and, even then, stealing the show. This year was no different — she was a hit. In fact, six years later, it is simply assumed that she will take part in the show and parents and staff look forward to her number each time. This year, with the success of the movie Frozen, it was an obvious choice as the source of material and In Summer, originally sung by the snowman Olaf as he wistfully contemplates the day when he can truly experience all that summer has to offer, simply demanded it become a tap number. Calling on the talent and skills of former tap dance teacher and choreographer Rachel Grilley for the dance choreography and veteran jazz and musical theatre pianist and arranger John Price, Sara definitely had a musical number worthy of her talents. Sara began studying dance in 2008 and has been dancing at Star Dance Studio since 2009. She began her vocal training with the SFArtsEd Players and the SF Glee Kids in 2012.